Our site offers an easy to use search box at the bottom of each page. Type in your favorite color to see all patterns with that color. Type in part of the pattern, for example "dou" instead of "double", and it will still find all occurrences of "double". Leave it blank, and it will find every pattern we have on our site. Have fun searching! Celebrating the Olympics in Sochi with this animated gif. The rings were made using the 4 Pin Fishtail pattern, except only one color was used in each bracelet, or in this case, ring. Go Olympians ! ! ! We are proud of you ! ! ! Bracelets make an ideal gift for your special Valentine. Any of our bracelets would be a joy to give or receive. Use Valentine colors such as red, pink, or white. Some nice choices you can make for a gift would be the Heart Shaped, Hugs and Kisses, Double Cross Long Heart Stripe, or Raindrops. Have Fun ! ! ! Another NEW Pattern - Bobble Bracelet ! ! ! 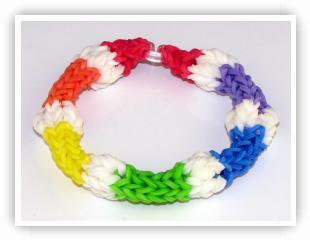 Another new pattern has been created by our group - the Bobble Bracelet. 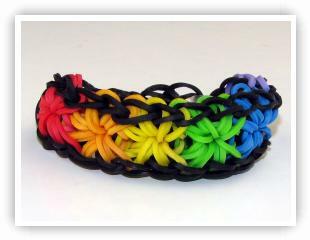 This pattern is an adaptation of the 4 Pin Fishtail Bracelet. For a bit of a change, you can replace the white segments with Glow-in-the-dark elastics to give it that extra cool effect when the lights are turn off! If you have mastered the 4 Pin Fishtail, then this will be a piece of cake to make! Featured Pattern - Starburst 2 ! 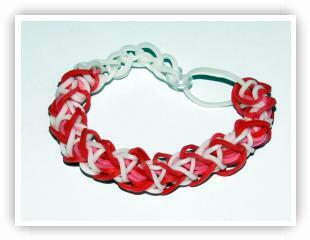 This Starburst 2 Bracelet was created by our group. It is a modification of the original Starburst, but adds to the pattern by making it wider and thicker. Have fun with this bracelet!